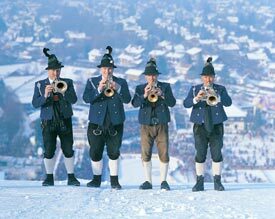 ABOVE: Garmisch-Partenkirchen's local brass make oompah in the Alps. Germany's largest alpine resort has a split personality, and not just because it consists of two towns that were merged for the 1936 Olympic Winter Games. Rather, it's because Garmisch-Partenkirchen is both a world-class ski resort and a summer vacation playground. When the skiing finally stops in early May, the town has just over a month to prepare itself for a summer onslaught of hikers, mountain-climbers, cyclists, spa aficionados, folklore enthusiasts, and high-altitude sunseekers. Garmisch-Partenkirchen has some 27,500 residents, but the daytime population may be closer to 50,000 on busy weekends when hotels are fully booked and daytrippers arrive from other cities in Bavaria by train or car. Still, there's plenty of space for sportif folk and sightseers--ranging from the 73 km of marked ski pistes and 100 km of walking paths in the winter to more than 300 km of alpine trails in the warmer months. Tourist activities are well organized. A modest overnight Kurtax or tourist tax earns you a GaPa Visitors Card that allows free travel on municipal bus lines, complimentary admission to many tourist attractions, discounts on other tickets, and accident insurance to protect you if you fall off the Zugspitze, get bonked by a wild roulette ball in the casino, or crack an elbow in the Wellenbad wave pool. Factor in the convenience of reaching Garmisch-Partenkirchen from Munich or Munich International Airport, and it becomes obvious why Bavaria's "Olympic Village under the Zugspitze" is a big draw for German and international holidaymakers.